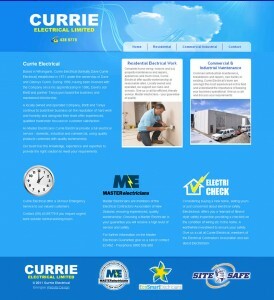 Based in Whangarei, Currie Electrical (formally Dave Currie Electrical) established in 1971 under the ownership of Dave and Glennys Currie. During 1996, having been involved with the Company since his apprenticeship in 1980, Dave’s son Brett and partner Tanya purchased the business and maintained directorship. A locally owned and operated Company, Brett and Tanya continue to build their business on the reputation of hard work and honesty and alongside their team offer experienced, qualified tradesmen focused on customer satisfaction. As Master Electricians Currie Electrical provide a full electrical service – domestic, industrial and commercial, using quality products combined with quality workmanship. Our team has the knowledge, experience and expertise to provide the right solution to meet your requirements.